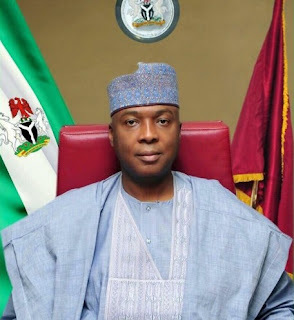 Senate President Bukola Saraki has started reaching out to the All Progressives Congress leadership and colleagues opposed to his emergence as the head of the National Assembly. A senator, loyal to Saraki, Rafiu Ibrahim, made this known in Abuja on Sunday just as it was learnt that the APC leadership decided to soft-pedal on its initial opposition to the outcomes of the National Assembly leadership elections in order to stave off rebellion by its lawmakers. Ibrahim said, “We are currently meeting with our colleagues in the Senate. Apart from the fact that the Senate President has been meeting with those who are aggrieved, we, members of the Like Minds Senators, are also engaging them on one-on-one basis. Some members of the Senate Unity Forum, who are loyalists of Senator (Ahmed) Lawan, also confirmed that Saraki and some of his supporters were making overtures to them. The senators were however, silent on whether the Saraki group offered them anything in return for their anticipated support. A ranking senator from one of the South-West states said Saraki personally discussed with him on the matter. He said, “It is true that the Like Minds Senators have been talking with us to support the leadership of Saraki but we told them that we are not having any personal issues with the Senate president and his deputy, Ekweremadu. Another senator from the South-West also explained that the SUF members would meet this week to review the reply of their party’s leadership to their conditions. The group had, through its spokesperson, Senator Kabiru Marafa, said it was demanding the immediate resignation of Ekweremadu and the investigation of the Clerk of the National Assembly, Salisu Maikasuwa, for his alleged role in the June 9 Senate inauguration. It was however gathered in Abuja on Sunday that the APC leaders opted to sheathe their sword after the Presidency reportedly intervened in the matter. Saraki, a former Kwara State governor, emerged the Senate President unopposed while APC choice, Ahmed Lawan, was one of the Senators waiting at the International Conference Centre to see President Muhammadu Buhari, who had indicated interest to intervene in the crisis that had preceded the National Assembly leadership elections.